100% LEAD FREE CRYSTAL - Luxbe's Wine Decanter made from lead-free crystal' it adds great look to any kitchen. 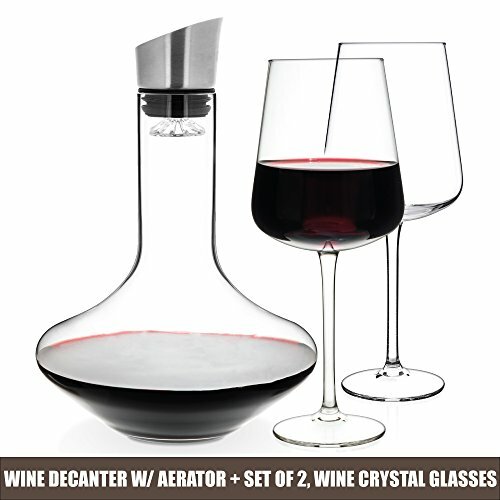 AMAZING SET OF DECANTER AND 2 GLASSES: You are all set with our Wine Decanter - Aeraror and TWO Wine Crystal Glasses. DECANTER PERFECTLY DESIGNED TO HOLD UP TO 1L OF WINE - When an entire bottle of wine is poured into our decanter thru stainless steel filter and aerator, is dispersed across the inner decanter bell to optimally aerate the wine, allowing it to "breathe", which releases more aromatic compounds. LUXBE's WINE DECANTER with AERATOR SET is an elegant accessory that is equally functional as it is dramatic. Our sleek glass design features a stainless-steel drip-proof spout; a reverse filter and tight silicone seal prevent any sediment from escaping into the glass. LEADED-FREE CRYSTAL GLASSES. SET of 2: - All our wine glasses handmade with pure crystal, you don't have to worry about lead leaching into your favorite red wine. As well as our wine glasses are dishwasher safe for easy clean up. If you have any questions about this product by Luxbe, contact us by completing and submitting the form below. If you are looking for a specif part number, please include it with your message.